Interested in starting a neighborhood watch program but don’t have the time to conduct/attend meetings? Want to know what’s going on in your neighborhood and share information with others living in your area? Consider joining Nextdoor.com, a virtual neighborhood watch program. 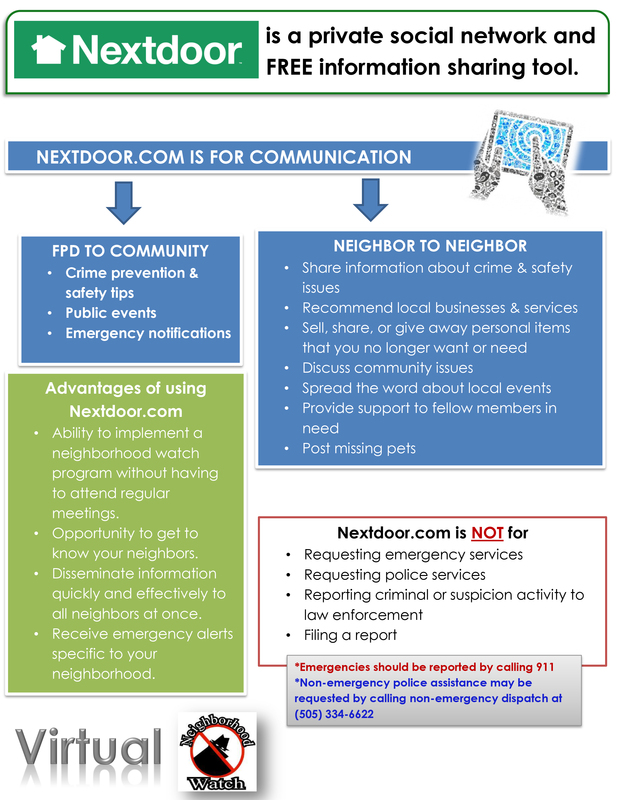 Nextdoor.com is a private social network and FREE information sharing tool that facilitates virtual neighborhood watch and fosters neighbor-to-neighbor communications. Who can communicate with each other on Nextdoor.com & what types of information can be shared? Are there types of communication that is not appropriate for Nextdoor.com? What are the advantages of using Nextdoor.com? The ability to implement a neighborhood watch program without having to attend regular meetings. The opportunity to get to know your neighbors. The ability to disseminate information quickly and effectively to all neighbors at once. The ability to receive emergency alerts specific to your neighborhood. Is my information safe on Nextdoor.com? Nextdoor.com values safety & privacy and makes it safe to share online, the kind of things you’d be okay sharing with your neighbors in person. Every neighbor must verify his/her address. Each neighbor signs in with his/her real name. Just like in person. You choose where your information is shared. Your website is securely encrypted using the https internet protocol. Information shared will never show up in google or other search engines. Nextdoor never shares your personal information with third-party advertisers. We look forward to connecting with you on Nextdoor.com to build stronger, safer neighborhoods throughout the City of Farmington.